Whether you are buying or renting, a new home is often one of the biggest investments you will make. Your sense of safety when you are in your living space is important to your comfort, and the locks to your entry doors are vital to your security. Bedford Lock & Key has been keeping families safe throughout Massachusetts for the last 50 years, installing and repairing lock systems in homes throughout the state. Our team will go to your home and re-key each door without having to change the lock completely. The position of the pins on the existing lock will be changed to correspond with new keys, or even keys for other doors around your home. Further your home’s security with the addition of a deadbolt to your lock! A deadbolt makes your doors harder to break down because it involves an extra piece of steel. 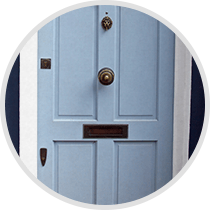 If you want to go the extra mile and install a Mortise lock, Bedford Lock & Key will be able to fit your door for it! Keep your correspondence and personal information safe by installing a keyed lock to your mailbox! An intruder may be able to use your mail slot to detect whether your home is safe to enter. Adding a lock prevents outsiders from having a way to look into your home. Tired of always losing your keys and having to hand one to a neighbor when you go away? Bedford Lock & Key installs keyless entry locks, allowing you to enter your home by typing in the code of your choice. You’ll also get backup keys in case you want both options! An additional security measure that can be taken on this entry point, working in conjunction with electronic garage door openers. Including chain door guards, door knockers, door stoppers, door viewers and sash locks. Keep your home secure from break-ins using anti-bumping locks. Anti-bumping locks prevent anyone from entering your home without the specific key for your door. A common entry practice in break-ins is to use a 999 Master Key to briefly activate the pins in your lock. If you are in need of a professional locksmith for your home security needs, contact Bedford Lock & Key today! Our team will assess your locks and address any changes or repairs that need to be made to increase the level of safety in your home. Bedford Lock & Key can be reached by calling 781-275-1597 or by filling out our online contact form.